MARKBY ROAD 15/05/2017. King George VI Coronation party photos May 1937. I recently found four old photos taken in Markby Road by my dad, Leonard Ball, on the occasion of the celebrations of the coronation of King George VI in May 1937. PHOTO 1. Taken outside the front doors of 30 and 32 Markby Rd, and shows (on the left) Mona Ball (my mother), Isabel Tuckey (my aunt), Fanny Neale (my nan), Doris Neale (my aunt), and Wilf Neale (my uncle). On the right are our neighbours Rose and Larry Mullins. PHOTO 2. Looking up Markby Rd from Bacchus Rd. The corner building on the left was a ladies' hairdresser run by a Mrs Lees. PHOTO 3. Street party in the middle of the road, photographed from the front bedroom window of our house (number 30). The lady facing towards us on the left, wearing a light coloured pinafore was Mrs Bird. PHOTO 4. The same street party photographed from ground level. I have just been looking at the photos of Winson Green. My father was born in Wellington Street and as a child I visited my relatives and grandmother still in the same house at No.27 this was until the late 50s. My grandmother was the cleaner at the Winson Green Picture House in the 40s and my mother and aunts used to sell chocolates in there during the late 20s & early 30s. They were supplied with their chocolates from Hydes shop which was opposite the gates of the prison across the road from what I remember as a child was a free nights lodging house for down & outs. The first place I lived as a month old child was in Markby Road but then we moved to Great Barr where I lived until 1960 when I moved to Kent. Throughout my childhood I spent at least one day a week at the Green and and used to play down the black patch park. My first job was at Stevensons Boxmakers in Anne Road. This was in 1951 &1952. I havn't been back since 1960 I cannot believe what has happend to B'ham and the surrounding area since I left. I will inform my daughter of your site as she is keen on geneology and likes to see photos of where her family. came from. 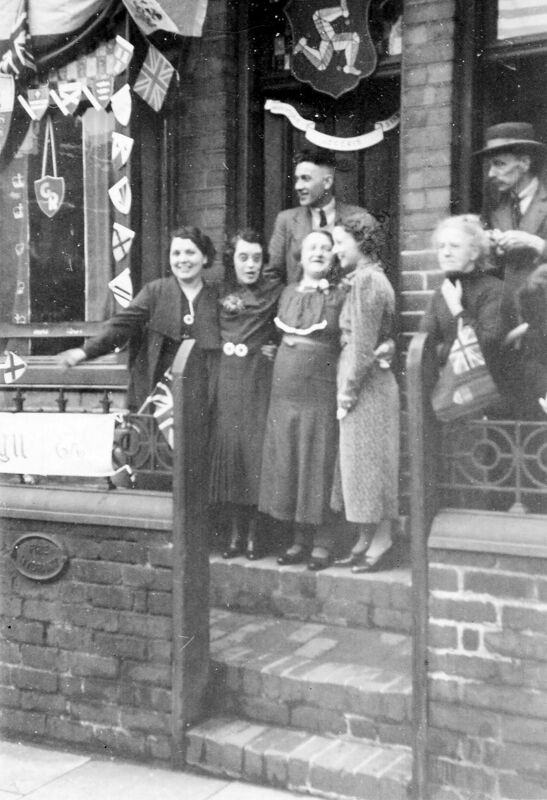 The attached photograph is from Coronation day 1953 in Markby Road, it was the Streets beauty contest and the photo was taken outside our house which was No 67. Being only eight years old at the time l can really only recognise one of the contestants, this being Sylvia Nichols who was on the extreme right of the line up and lived three doors down at No 61. She and her husband had two daughters but unfortunately l really cannot recall their names, however maybe if they or anyone else from the Road see this old photo it may be of interest and maybe names can be put to the beauties, incidentally l have no idea who won either as Mr Matthews the coalman from across the Road was giving all us kids a tour of the streets on the back of his lorry and that was the thrill of the day, can you imagine that happening now with todays H&S regulations plus litigation if one of the kids got dirty or sustained a scratch. Lived at Markby Road and at the other end I think it was called Benson Rd. There was a public baths. Also a coal yard were I pulled many a barrow full of coal with the little wheels, that was one of my many jobs on a Saturday. I Went to Foundry Rd School and Handsworth New Road School. We used to have our dinner in the school holiday there as well. A.The old Handsworth New Road School Building is currently used as some kind of center where people meet.